Each fingertip pressure sensor mounted on this glove is connected to an LED; the intensity of the light emitted by the LED varies in accordance with the pressure applied by the fingertips. Photo: 2017 Someya Group, The University of Tokyo. A newly-developed printable elastic conductor retains high conductivity even when stretched to as much as five times its original length, says a Japanese team of scientists. The new material, produced in paste-like ink form, can be printed in various patterns on textiles and rubber surfaces to create stretchable wiring for wearable devices that incorporate sensors, as well as to provide robots with human skin-like functions. The scientists report their work in a paper in Nature Materials. Wearable devices that can monitor a person's health or physical performance, like heart rate or muscle activity, are currently being developed, with some products already on the market. Moreover, the advent of robots in areas such as health care and retail, in addition to manufacturing, should lead to further applications for a sensitive, elastic conductive material that can withstand high strain from stretching. "We saw the growing demand for wearable devices and robots," says Takao Someya at the University of Tokyo's Graduate School of Engineering, who supervised the current study. "We felt it was very important to create printable elastic conductors to help meet the need and realize the development of the products." To achieve a high degree of stretchability and conductivity, the researchers mixed four components together to produce their elastic conductor. These components were: micrometer-sized silver flakes, fluorine rubber, a fluorine surfactant that can reduce liquid surface tension and an organic solvent to dissolve the fluorine rubber. The resultant elastic conductor markedly outperformed a previously-developed version from 2015. Without stretching, printed traces of the new conductor demonstrated a high electrical conductivity of 4972 siemens per centimeter (S/cm). When stretched by 200%, or three times its original length, the conductor still displayed a measured conductivity of 1070 S/cm, nearly six times that measured with the previous conductor (192 S/cm). Even when stretched by 400%, or five times its original length, the new conductor displayed a measured conductivity of 935 S/cm, the highest level recorded for this amount of stretching. Investigations with a scanning electron microscope (SEM) and a transmission electron microscope (TEM) showed that the high performance of the conductor was due to the self-assembly of silver nanoparticles after the conductive composite paste was printed and heated. These nanoparticles were one-thousandth the size of the silver flakes and were dispersed uniformly between the flakes in the fluorine rubber. "We did not expect the formation of silver nanoparticles," Someya says. Furthermore, the scientists found that by adjusting variables like the molecular weight of the fluorine rubber they could control the distribution and population of the nanoparticles, while the presence of the surfactant and the degree of heating accelerated their formation and influenced their size. 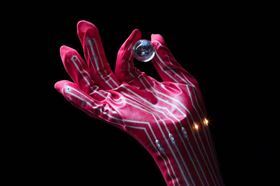 As a test of this conductor, the scientists used it to print stretchable pressure and temperature sensors on textiles. These sensors, which can easily be laminated onto surfaces with heat and pressure, could record precise measurements even when stretched by 250%. This is sufficient stretching to accommodate high-stress flexible areas such as elbows and knees on conformable, form-fitting sportswear or joints on robotic arms designed to surpass human capabilities and thus undergo higher strain. The new material, which is durable and suitable for high-capacity printing methods that cover large surface areas like stencil or screen printing, should offer easy installation. Its ability to form silver nanoparticles when printed provides an economic alternative for realizing a wide range of applications for wearables, robotics and deformable electronic devices. Someya and his team are now exploring substitutes for the silver flakes to reduce costs, while also looking at other polymers such as non-fluorine rubbers and various combinations of materials and processes to fabricate other elastic conductors with a similarly high performance. This story is adapted from material from the University of Tokyo, with editorial changes made by Materials Today. The views expressed in this article do not necessarily represent those of Elsevier. Link to original source.